Becoming a homeowner is a very exciting time. The freedom of having your own home and being able to make any changes you want is very fulfilling. With this freedom comes a whole lot of responsibility. You have to put the trash out on trash day. Unlike apartment living where there is always a dumpster to throw your trash, neighborhoods have trash picked up once per week. If you miss it, you will have to store your trash an extra week which quickly piles up. You need to own fire extinguishers. Granted, you should also own a fire extinguisher if you live in apartment. I never thought of it before owning a home though. I have two fire extinguishers in my home. One on each floor. You need to maintain the lawn. This is a big one for me. Many of my neighbors do a horrible job at maintaining their lawn which makes the neighborhood not as pleasant to live in. Nobody wants to be going on a walk and have to climb over your grass and duck under your trees that are impeding the sidewalks. You need to shovel the driveway in a timely fashion – be sure to own a shovel before the winter season starts is you are in an area that gets snow. In many cities it is mandatory to remove the snow from the sidewalk in front of your house within 24 hours of the snowfall ending. This is for the safety of everyone walking. It is typically not required to shovel your driveway but it does make your home look more presentable and helps avoid slipping on the ice. You need to change the filter in the furnace monthly – You should change the filter in the furnace each month. I have to admit, this has probably been the one thing that I still struggle with remembering to do. But, it is very important because it helps provide clean air for your home and can prevent fires. You may need to blow out your sprinklers – If you live in an area with freezing temperatures in the winter, you need to blow out your sprinklers and exterior pipes for the cold season. Otherwise, the water in your pipes will freeze and expand causing the pipes to burst. But, you won’t know they’ve burst until it’s warm again and you go to use the pipes. Then you are in for potentially a huge mess and the pain of repairing the pipes. You may need to disconnect hoses in the winter – This is for the exact same reason as blowing out the sprinkler. If you leave a hose connected to the spout, the pipes are more likely to freeze. You need to trim the trees – As a neighbor, this is one of the things you can do not only for yourself but for your neighbors. Of course, a trimmed tree always looks better than a tree that hasn’t been maintained but have you walked around your tree and noticed if it’s covering anything? Is it going over your neighbors fence or hanging onto their driveway? Does it hang over the sidewalk blocking the path or making your neighbors duck? Nothing is more annoying than being on a peaceful walk and having to duck or maneuver to avoid a tree that hasn’t been maintained. Well, mosquitoes are more annoying but this is still pretty high on my list. Neighbors can still hear your loud music – Just because you live in a house does not mean your neighbors can’t hear your music. Yes, we can still hear your loud music even if you live down the street and our windows and doors are all closed. Please be considerate and keep the music at an acceptable level during acceptable hours. Having two fridges makes it easier – This one is very helpful! I’ve had two fridges most of the time that I’ve owned my house but for a majority of the time I only used one of them. Now, it’s a habit to use both and it is so helpful! No more freezer Tetris! 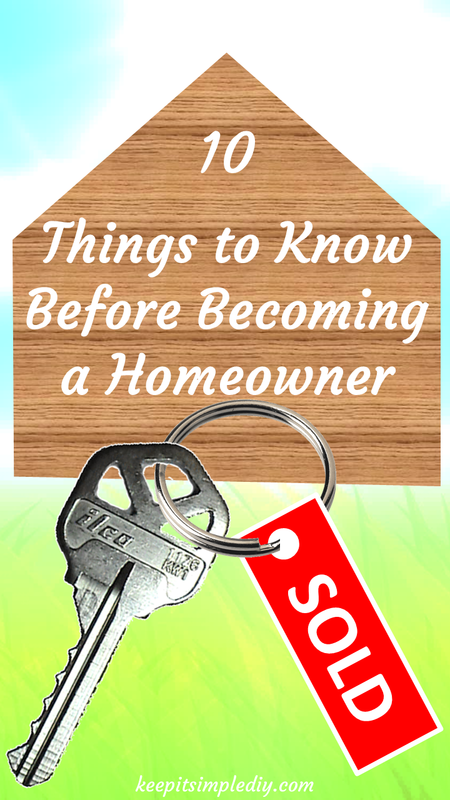 What tips do you have people who want to become homeowners? All your advice is spot on. It helps to be neighborly and bake something every now and then to take over, help shovel the snow etc. This is such great advice – we’re hoping to move out of our apartment by next summer, so these are things we should remember if we become homeowners soon! These are great tips. I’m an apartment renter but I even know people who rent a house and didn’t realize some of these they would need to plan/ prep for. I was having a conversation with a coworker the other day and we both we’re talking about how, it can be a little frustrating paying rent instead of paying each month knowing you will own it someday but man there is a lot more stuff to worry about when you own a home.